The information that credit unions produce and store comes from several different sources. In fact, most credit union data come from an average of between six and eight sources, although some may include more. All these individual streams of data can be difficult to parse on their own. It’s not surprising then that credit unions also have a hard time bringing all the sources of data together. If both the first and second statement are true, then so must the third. We have successfully completed a logical syllogism to its conclusion! Analytics platforms are light years more sophisticated than logical syllogisms. Instead of relying on two “true” prepositions, they assign weight and value to countless points of data, and then they use predictive analytics models to draw eerily-accurate conclusions from massive sets of information. 3. Why do Analytics Platforms Require Data Integration? The problem with the data generated by credit unions is that it’s heavily siloed. All the data is coming from different sources, and rarely do those sources communicate well (if even in the same language). Their output comes in different forms because the output addresses different areas. However, credit union analytics platforms require that data to be in one language, and they require that data to be in one place. In the syllogistic example above, imagine what kind of conclusion we could have drawn if instead of neatly compiling the two prepositions together in one blog, we put them in two different blogs, on two different websites, in two different languages. Good luck drawing a decent logical conclusion from that! 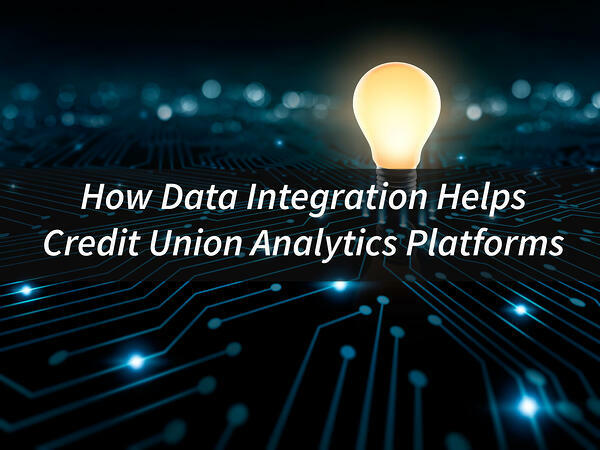 Data integration for credit unions combines the many sources of data and converts them into one easy, single point of truth. Essentially, data integration helps credit unions collect and store their data and turn it into a usable resource. What it all comes down to is building a better analytics platform that will allow credit unions to compete with other financial institutions. Turning multiple siloed data streams into a single point of truth prepares data scientists, analytics platforms, and other programs or expert personnel to more quickly and accurately asses the mountains of data generated daily by credit unions. If you’d like to learn more about what you can do with data integration, or if you’d like to see what happens when credit unions undertake collaborative analytics, follow the links below.